Nice to see you clicking to this site. Since you are here you are probably interested in wooden rings and would like to find out more about the details of making, ordering and shipping. We have prepared a list of answers to help you satisfy your curiosity and get you closer to wearing some wood on your finger. We know everyone has different questions popping up in their mind and the variety is big so feel free to contact us. Click here to send us an email. All our rings are made using a special bent wood technique. Basically, we bend a thin peace of wood around itself to form an extremely tight roll. We bond the band together using adhesive that makes it stronger than a singular carved out piece of wood. Then it is finely sanded down to the right shape and size. In addition, they are coated with waterproof finish. Rings made this way are very resistant to breaking. All the rings are made by Vasja. Click here and scroll down to see who is that fella. Can you engrave the rings? Yes, we can engrave the rings. How do I buy the engraving and specify the words? Under size selector you have a question asking you whether you want engraving or not. Select yes. This will open a new text box and you will be able to type the words you want to engrave on the ring. Wooden rings are surprisingly tough. They are strong and will not break easily due to bent wood technique being used to make our rings. The disadvantage in comparison to metal rings is that wood is not as hard as metal. Therefore, scratches from handling hard and sharp objects are more visible. It just means that the ring needs to be re-coated and re-polished to get smooth look again. How about water resistance, can I keep it on while I have a shower? It is advisable to take the ring off at occasions where it would be exposed to water for longer period of time. However, it is not practical to take it off for every hand rinse or shower so you can leave the ring on for showers. The ring is coated with water prof layer so it should not be affected. However, it is still wooden piece of jewelry so often exposure to water will shorten the life of the ring. We have a lot of different kinds of wood available. Just scroll through the store. If you are after a particular type of wood please let us know here. We can make rings that vary in sizes between AU/UK size A (US size ½) and AU/UK size Z½ (US size ¾). Each ring can be made in between 3 mm to 8 mm in width. If you want it to be any different than what it is on the photo, please contact us or make a comment at the checkout. How do different widths look on a hand? What different colors of wooden rings are available? There is a really big variety of wood types available please scroll through and find the one you like. Hard question! Usually the first feeling is the best choice. If you still can’t decide here are a few photos to help you compare rings side by side: photo 1, photo 2. Is the ring that I ordered going to look exactly like the one on the website? Not exactly the same, but it will come quite close. There are many factors that contribute to the difference. Your screen settings, photos on the website are shot in the studio with different lighting, wood tone varies – even the same piece of wood can have many different shades and pattern. I suppose that’s what makes each wooden ring unique. How do I maintain the ring? Once you put your ring on your finger, you don’t have to do much. Here and then you can buff out the scratches with a cloth and a bees wax or similar product. If the ring gets more damaged, you can send it back to redo the finish and fix small scratches. 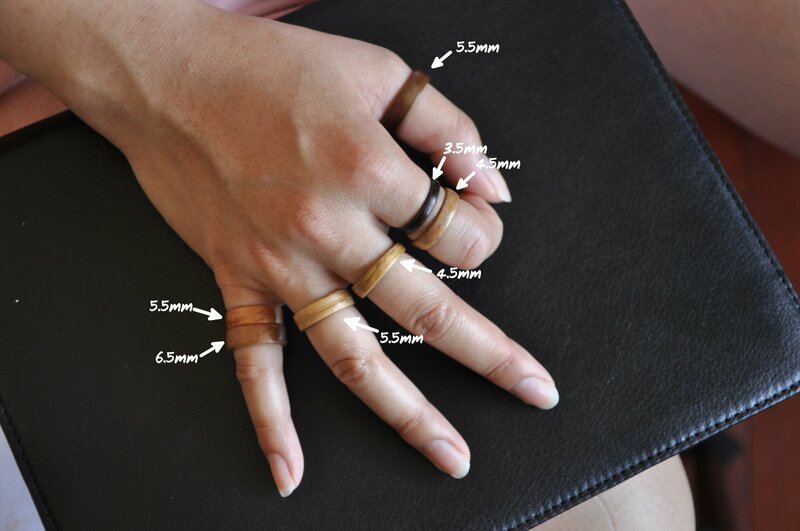 Why ordering a wooden ring? Once you put the ring on your finger you will be surprised how light the ring is. The ring will give your finger a gentle and warm hug that you will miss every time the ring isn’t on your finger. Our rings are eco friendly. Only very small amount of wood is used. We use wood veneer pieces that are beautiful left over cuts from furniture shop and would otherwise be wasted. And if you feel like everything that you touch lately is mass manufactured by machines or imported from a country where people work for pennies than this is another reason to buy our wooden rings. All the rings are hand crafted here in Australia by the owner of the store. How do I find out which size is the right for me? Best way to find the right size is to go to a local jeweler and ask him or her to measure your finger. If the jeweler is kind enough you will get the right information about the size of the ring you need to order. It is worth mentioning to the jeweler how wide the ring is. Wider rings need to be bigger in order to fit over the knuckle. Another option to find out the right size is to measure a ring that already fits you. Measure the ring with a ring mandrel (sizing stick) or get a caliper and measure inner diameter. To be sure that that you got it right do the measurement several times on different parts of the ring. Other measuring techniques have proven to be unreliable. You can use most of the main credit cards as well as PayPal. You can if you are from Australia. If not than send us an email first. Click here. It might be possible any way. How long will it take for the ring to be finished after I order? We’ll start working as soon as possible. It usually takes about 3 weeks to finish a ring. I am in a hurry. Can you do it faster? We can sure try! Shoot us a message. Click here. If you are from Australia standard delivery takes 2-6 business days. If you are from any other part of the world it usually takes between 10 to 20 working days. Click herefor more information. How long does express delivery take? Within Australia you’ll get the ring the next day. Anywhere else it is between 4 to 10 working days. It varies depending on where you are from. One way to find this out is to add a ring into the cart and you’ll be able to see the shipping costs. Or click here. With most options of shipping you do. The only option available that does not have tracking number is standard domestic (within Ausralia) shipping. All standard shipping within Australia is free. However we strongly encourage you to pick express shipping. It does not cost much extra and the service is way better and more reliable than standard shipping. You get tracking number with express and the rings doesn’t get lost in the mail like they sometimes do with standard shipping. You mentioned lost package in your previous answer. What do I do if the ring does not arrive? Firstly, don’t panic… If the ring has not arrived in a reasonable time, in most cases we are able to recover the package. In 90% of the cases, the postman has missed you and you did not get the notification about the package. So first thing to do is to call your local post office or just go there with your tracking number. They will probably be able to tell you where the ring is. They tend to keep that kind of mail at the post office for about 10 days and you can just pick it up – happy as Larry. If you don’t show up within that period they will send the ring back to us. What if I don’t have the tracking number? You only would not have the tracking number if you selected standard delivery within Australia. That is why we recommend express option. It is more secure, it never gets lost. In case the ring has not arrived with standard post please let us know. I am in a real hurry! Are there any faster options? We have some courier options. Let us know you are in a hurry and we’ll give you a quote for a courier option. I don’t live in Australia, will I have to pay any duty and taxes when receiving the ring? Most likely not. If you are from the US any goods for personal consumption valued under US $ 2500 usually don’t not get taxed. Also the thresholds in EU countries are mostly below the value of one wooden ring. In case your country charges duty and tax on imported goods, you will get a notification from the authorities. You can cancel the order within 48 hours after the purchase. After that we don’t really like to receive cancellations since we probably already started working on the ring. Every ring is custom made here, we don’t mass produce the rings and hold any stock. How do I cancel the order? Just give us a call or drop an email from here. You can also just reply to the confirmation email you got. Can I return the purchased item? Generally we don’t accept returns. All the rings are custom made and we don’t hold any stock. But any way give us a shout here to tell us what bothers you. Maybe there is something that we can do about it. O no, something is wrong with my ring! Can you fix it? We are sorry to hear that! Please contact us and we’ll do our best to sort it out. If possible send us some photos of the ring and a description what happened. There is a warranty policy that protects your ring for up to 1 year since the day that you received it. Here is where you can read more about it. I just received the ring and it does not fit. Can you help? Tell us more. Is it too small or too big? If it is a bit too small than you can send the ring back and we might be able to resize it. It will not cost you anything except postage. The only way to widen a wooden ring is to take some material from the inside. We can go up for about ½ size. In any case please contact us and we’ll find an appropriate solution. The ring is awesome and I want to tell you that. How can I do that? That is nice to hear! You can do this in a few different ways: Simply follow the link that is in the emails related to the ring purchase. You can log into our woodenringstore.com.au website and leave a review there. Or you can simply drop us an email from here.